Selecting a combination of chairs and tables to comprise one’s outdoor dining set is very much a matter of personal taste and the alternatives are shown in the extensive catalogue of Chairs and Tables Fine Teak Garden Furniture. Careful observation shows the options available when choosing your own ideal combination. There are a number of styles from which to choose, the Deluxe Banana Furniture for example, people with a flair for detail will love the outstanding lines of the Banana range of products with their subtle sweeping contours and wrap-around comfort. In the Banana Deluxe Teak Furniture range there are Banana Benches and Banana Chairs – a superb teakwood Deluxe Arm Chair plus Deluxe Side Chair, and there is even a splendid Banana Coffee Table for the occasional snack or glass of something cool and fizzy. A combination of Banana Teak Arm Chairs and Banana Teak Side Chairs allows a perfect way to seat a number of diners comfortably with, say, a pair of teak Arm Chairs for the head of the table that can then be used separately more often whenever the sun shines and the patio is warm enough for one to sit out. Banana Teak Bench Deluxe is a delightfully designed bench that stands out from the rest having its own unique style, in combination with Banana Deluxe Arm Chairs, and a Banana Teak Coffee Table it is possible to make excellent use of a smaller area of patio, decking, a lawned area or a conservatory in which to sit in comfort and enjoy both fresh air and pleasant warmth. Chairs and Tables Luxury Teak Garden Furniture is produced with comfort in mind and with dependability at its heart. The team go to great lengths to make exceptionally good furniture that will last a lifetime and remain good looking throughout. All of our teakwood furniture is manufactured using Grade A plantation grown teak that has been selected by hand and well-seasoned giving it exceptional straight grain and no knot holes. The craftsmen team employ traditional methods of construction including the use of mortis and tenon joints made doubly secure with dowel inserts, this gives extra durability and prevents water ingress into the joints. Because solid teakwood is naturally water resistant your top-quality teak garden furniture will only need an occasional spot of TLC including a rub down with some teak oil for it to keep its lovely patina. All surfaces are well sanded for your protection. Choose your ideal combination of luxury outdoor space furniture and enjoy. The Chairs and Tables Teak Garden Furniture Team is at your service. Not just any old benches, Chairs and Tables Teak Garden Furniture benches are a cut above the rest. For anyone investing in garden furniture the Winter season is a brilliant opportunity to take time and select the best option to suit your needs. Benches make excellent Christmas gifts, for anyone with a garden, patio, decking area or veranda the Southwold and Aldeburgh models are perfect, pick a suntrap, a south-facing wall maybe and enjoy sitting with a cup of tea, or a G and T, to take in the view. On doesn’t need a vast area of garden to enjoy sitting on a bench on the better Winter days, and with a patio heater or chimenea you could keep warm in the process and toast a marsh mellow or two. Chairs and Tables Teak Garden Benches are superior due to their inbuilt comfort, top quality teak construction using traditional techniques and exceptional finishing. In investment terms for any business, golf club, or restaurant, the return is substantial, these benches will retain their good looks and quality long after purchase. The Southwold and Aldeburgh benches are manufactured using Grade A plantation grown teak, because of the exceptional weather resistance qualities of teak they will withstand the elements for years to come. 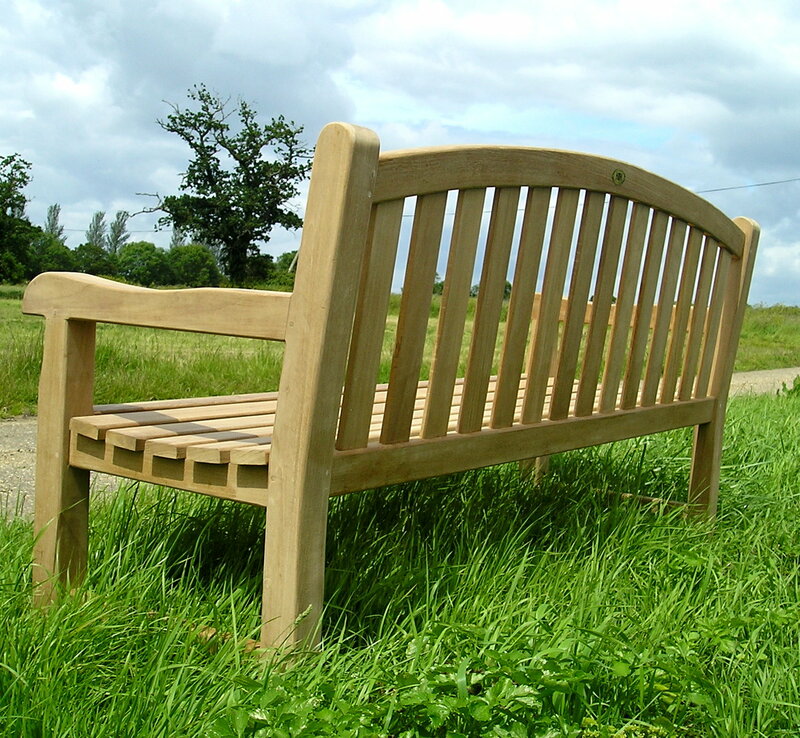 ‘In Remembrance’ benches make a fine memorial to a loved one, the Chairs and Tables Teak Garden Furniture Team believe that their products must reflect the gravity of such events and we are in no doubt that either of these grand benches is a worthy memorial. With the addition of an engraved plaque in commemoration these products make a splendid memorial. The Southwold bench is available in 4feet, 5 feet and the deluxe 6 feet sizes, with enough room for a couple of adults and the larger ones a small child too. Similarly the Aldeburgh range is available from stock in the same sizes. Like the Southwold benches the design is traditional and has beautiful lines, whereas the Southwold benches have a straight horizontal back the Aldeburgh has a curved back making it a very attractive looking feature. Because teak has both silica and rubber in its composition it has very good water resistance, which is why it used so much in the finest ocean-going boats. The construction of the product is completed by craftsmen using tried and tested methods, mortis and tennon joints for example with dowel inserts to ensure that the joints are as water tight as is possible. Following completion of the assembly stage the teakwood is sanded to perfection to remove any snags or rough edges that may catch a finger or clothing. The team are happy to help customers with their inquiries and offer guidance where required. Customers planning their 2019 Top Quality Garden Furniture selections are recommended to peruse the Chairs and Tables catalogue and start planning now. Fine Teakwood Garden Furniture does not have to be large enough to feed a big family with room to spare. Many discerning home owners may want a well-proportioned furniture set that will accommodate two people plus a couple of guests in comfort. Regardless of the amount of outdoor living space that one has it is possible to have a tasteful combination that is practical, comfortable, stylish, solid and attractive – a true eye catcher in fact! So, whether one has a bijou patio, conservatory, or deck-space the Turnworth Table Set is perfectly suited. Likewise, people with masses of open space but not wishing, or needing, to fill it with al fresco dining furniture will benefit from this very appealing set. The Chairs and Tables Fine Teak Garden Furniture Turnworth 120 Table is 120cm in diameter – whisker short of 4 ft and circular with a central hole to accommodate a parasol for those blistering hot days – the hole is capped with a solid brass cap when not in use – because details matter. As with all Chairs and Tables Luxury Teak Garden Furniture the teakwood is solid and is sanded to a smooth finish making it a perfect platform for dining and entertaining. To complete the Turnworth 120 Tables Set purchasers have a choice of four different Chair styles. Bali Arm Chairs are superbly comfortable armchairs with Criss Cross and Block Design on the Chair Back. This is an exquisite deluxe carved fixed armchair with elegant and rounded front chair legs. Banana Arm Chairs have a high back and arms that curve around you giving a feeling of wrap-around. Banana Chairs are perfect with their added cushion that is attractive, waterproof and very comfortable. Lovina Stacking Chairs allow for easy storage and exceptional convenience. When in use for a cosy tete a tete the unused chairs can remain in storage allowing more space, all you need now is flowers, sweet music and a bottle of something fizzy, perfect. Southwold Arm Chairs, this beautifully reliable looking chair is spacious and comfortable, and a real eye catcher! Chairs and Tables Teak Garden Furniture is manufactured using only well-seasoned sustainably sourced solid Grade ‘A’ teakwood that is plantation grown to peak condition so that there are no knot marks and the grain is in peak condition for furniture manufacture, once sanded to a satin smoothness it will look wonderful and feel silky smooth. Teakwood that is ready for use is hand-selected and skilfully shaped so that each piece of furniture is smooth to the touch and has a delightful patina that will look good for years to come with a little TLC. Making joints that will remain secure and weather proof is very important especially for furniture that may stand out in all weathers. Teakwood is naturally weather resistant even in our British winters. Solid yet well proportioned, classic lines that are unfussy but stylish, comfortable and spacious, elegant and sophisticated and all that one would expect from a truly outstanding item of garden furniture. Exceptionally well made and a fitting product as one would expect from the Chairs and Tables Fine Teak Garden Furniture People who put pedigree before price. The Aldeburgh Teak Bench De Luxe is available in two sizes, 5ft and 4 ft long. Whether customers would like a truly excellent Memorial Bench with a tasteful Brass Plaque, or a Bench to grace the Cricket Club spectators seating area, or for the 19th Hole at the Golf Club, either one of these two benches would be just perfect. The Aldeburgh Teak Benches Deluxe would be eye catching and enjoyable to use in a domestic situation too, on a patio, in a conservatory, well-placed on lawns – overlooking a glorious water feature perhaps, or on decking. Have you a compact area of outdoor living space that you would love to sit-out on? An Aldeburgh Teak Bench would give comfort, especially with a rather nice padded cushion, and allow for pleasant al fresco chats with friends aided by a nice G and T maybe? Chairs and Tables Teak Garden Furniture is manufactured using only well-seasoned sustainably sourced solid Grade A teakwood that is plantation grown to peak condition so that there are no knot marks and the grain is in peak condition for furniture manufacture, once sanded to a satin smoothness it will look wonderful and feel silky smooth. Teakwood that is ready for use is hand-selected and skilfully shaped so that each piece of furniture is smooth to the touch and has a delightful patina that will look good for years to come. Making joints that will remain secure and weather proof is very important especially for furniture that will stand out in all weathers. Employing solid teakwood and using mortice and tenon joints ensures that your bench will be a fitting memorial for a very long time. Teakwood is naturally weather resistant even in our British winters. Chairs and Tables Fine Teak Garden Furniture is the gold standard in Luxury Teak Garden Benches. Have You Seen the Asmara Teak Garden Sofa, this is Sheer Luxury! To complete an outdoor living space to perfection requires not only Tables and Chairs from which to dine, and with Chairs and Tables Fine Teak Garden Furniture discerning customers may choose from an exciting and extensive range but having somewhere to relax and chat in comfort is essential. Now that our summers appear to be hotting up, this year we have enjoyed temperature in the mid 30’s c, sitting out for relaxation and to enjoy the company of family and friends is becoming an exciting life style choice, forget sitting in a stuffy sitting room or watching re-runs on Television and chill out with a G and T whilst putting the world to rights. The Asmara Teak Garden Sofa is an outstandingly comfortable sofa style seat with room for two adults or a gaggle of children – three at least depending on their size. The Asmara Sofa is robust and spacious at 5 feet wide designed in a high-back format and with a solid feel to it giving the sofa a stable feel. Two delightfully plump blue or green waterproof cushions c 4 inches thick (or 12cm) adorn the sofa making it the kind of seating that one could settle into in comfort. The Asmara Sofa has a wrap-around feel to it allowing a feeling of being snug and private for a quiet tete a tete later in the evening when the warmth of the sun has eased away. The Asmara Teak Garden Sofa may be purchased individually or complemented with the addition of an Asmara Teak Garden Armchair or two allowing for guests to join you for drinks and snacks. To fully enjoy the Asmara ‘look’ perhaps you might wish to consider the full Asmara set which not only includes this sofa, but also two Asmara arm chairs as well as the Asmara low coffee table. The Chairs and Tables Team work hard to create exceptional quality Teak Garden Furniture that will retain its character and exceptional good looks for many years to come and are happy to advise customers as required. Every item of Chairs and Tables Luxury Teak Garden Furniture is produced using only Grade A solid teakwood that has been plantation grown where it is responsibly sourced. Being dedicated to protecting the environment Chairs and Tables will only use the best teakwood that is hand selected, knot free and well-seasoned. Solid teakwood is used because it is weather resistant, poor quality imitations may be laminated meaning that the core wood can rot, whereas solid teak will not. Because Chairs and Tables respect their discerning customers wishes to purchase the best quality available their Fine Teak Garden Furniture is constructed using traditional methods and materials, it is vital that high-end furniture looks the part and is as good as it looks. When a loved one passes away many people would like to have a permanent memorial with which to remember them for their uniqueness and the special memories associated with them. Much the same sentiment applies to the loss of a person with whom we have worked, played golf with, socialised with, known for many years and to whom we wish to show our respects. With some consideration donors can make a memorial a little more special, with some forethought one can design the memorial in such a way as to create a living memorial that is at the same time a comfortable and comforting remembrance. the Round Backless Tree Bench, available in two sizes, this delightfully designed and created Teakwood bench is as the name suggests circular with a central void. On the catalogue page this shapely bench is displayed with a brace of Boat Shaped Teak Shelving Units. However, for a memorial to someone who was a keen garden lover, amateur or professional, what would be better than a memorial tree or a striking plant? At the centre of the Round Backless Teak Tree Bench one could plant a well-chosen tree; a flowering fruit tree, an Acer – available as a miniature or full-size plant. Evergreens are worthy of consideration too as they remain green throughout the winter months, a Pencil Pine for example or a Cyprus would look spectacular. With some careful planning and checking a good example can be chose. To finish off the memorial a discreet metal plaque may be added to the Bench so that the person may be honoured and remembered permanently. Plants and even sculptures can be used as a centre piece and Chairs and Tables do include in the catalogue Natural Teakwood sculptural centre pieces that are striking and attractive. With some artful planning the Round Backless Teak Tree Bench will become a focal point in any garden, terrace or patio that will become a living reminder of someone who is missed. What better memorial could on have? Every item of Chairs and Tables Teak Garden Furniture is crafted from solid plantation grown Grade A teakwood as only the finest will do. Using traditional carpentry methods and hand selected teakwood each piece of Luxury Teak Garden Furniture is shaped and smoothed to perfection, no sharp snags to catch on clothing or sensitive skin. Teakwood is tough and weatherproof by nature and will withstand our British climate, and with some tender loving care, a rub down with teak oil and a cloth, will look wonderful for years to come. With low maintenance plants or a tree, the combination will keep those precious memories alive. Chairs and Tables Teak Garden Furniture for people with fond memories. Over the Summer the Chairs and Tables Luxury Teak Garden Furniture Range has featured at our leading Country Shows throughout Suffolk, and Norfolk. The remaining opportunity to see them is August 27th at the Aylsham Show. The top-class web site is easy to access (just click on the link above), and even easier to follow, with clearly marked options showing product grouped into Furniture Sets and also into individual product groups; tables large and small, chairs including folding and stacking chairs, steamer chairs and loungers, plus the accoutrements to make one’s outdoor space perfectly comfortable, just what one would expect from the Nations Premier Luxury Teak Garden Furniture online supplier. Once prospective buyers have researched the alternatives making a purchase is simple, with clear instructions and advice about Delivery and Returns procedures and online Ordering advice along with the Terms and Conditions, the entire process is crystal clear and unambiguous, as one would expect. In addition, the web page gives a good deal of biographical information, support advice and contact details – customers wishing to gain clarification by calling into the Home Base are asked to, please, call ahead first. Alternatively, email or telephone, when every attempt will be made to satisfy your enquiry. Collectively these social media platforms do present a superb look at the product in situ at the Country Shows and elsewhere allowing people to gain an understanding of the true quality of the product range i.e. it is one thing to say that a table top is 40mm thick, over 1.5 ins, but to see clear photographs showing the solid quality of the product leaves one in no doubt about its stability and reliability, and the superb finish achieved by traditional craftsmanship. Every item of Chairs and Tables Teak Garden Furniture is crafted from solid plantation grown Grade A teakwood as only the finest will do. Using traditional carpentry methods and hand selected teakwood each piece of Luxury Teak Garden Furniture is shaped and smoothed to perfection, no sharp snags to catch on clothing or delicate skin. Teakwood is tough and weatherproof by nature and will withstand our British climate, and with some tender loving care, teak oil applied with a cloth, will look wonderful for years to come. Chairs and Tables Teak Garden Furniture for people with excellent taste.